This week is being a busy one, but I want to show you today a vintage jewelry box I made for a friend of mine. We were participating in a crafty friends exchange and I was paired with my friend Pili (yes, we have the same name!). She is really talented, so it was really difficult for me to think of something I could do to surprise her as she knows a lot of techniques and make beautiful things. You can see a bit of her work here. So I went “shopping” to my basement to see what I could do for her, and found this old fashioned jewelry box for kids. I thought it was perfect so I rushed home and started to paint it with my DIY chalk paint when I remembered I hadn’t a picture of it, aarrgg!! I hope you can make an idea of how it looked like. The best about chalk paint is that you don’t need to sand first or add any primer to the object you want to paint. Just grab a brush and start painting! When it was fully painted in white, I let it dry and went to my laptop to play around with my Photoshop. I ended up making a cute print for the top. Then, as the print had some greenish tones, the girls and I tried to achieve a similar color mixing paints. I tell you that is absolutely fun!! I can’t tell which colors we mixed because I didn’t write them down, but next time I will do if for sure. I painted the whole thing in that color, and then I decoupaged it with the print. I used white glue + water in a 50-50 ratio. The last thing was to add a layer of varnish to protect it, and it was ready to send. When my friend received it she told me she fell in love with it. She liked the color very much, she even had in her bedroom some stuff with a similar color to the vintage jewelry box I sent her. I hope you like it too! 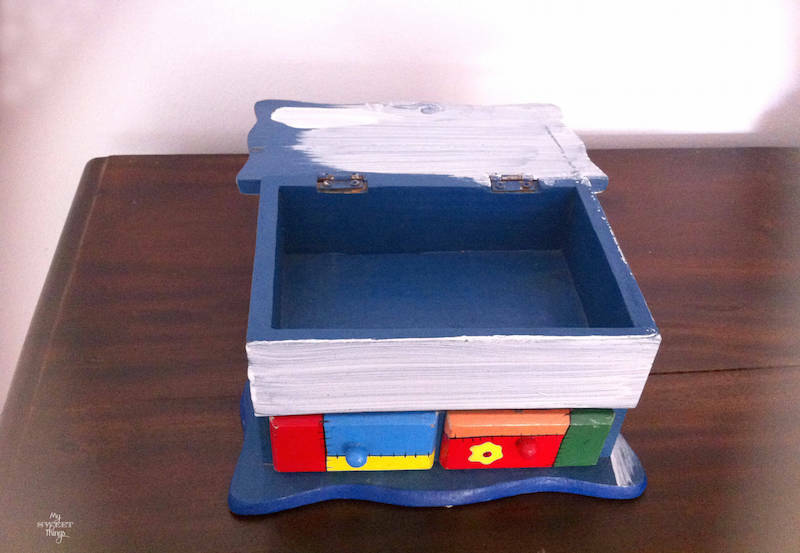 You can see another jewelry box makeover or some other projects on the Gallery. 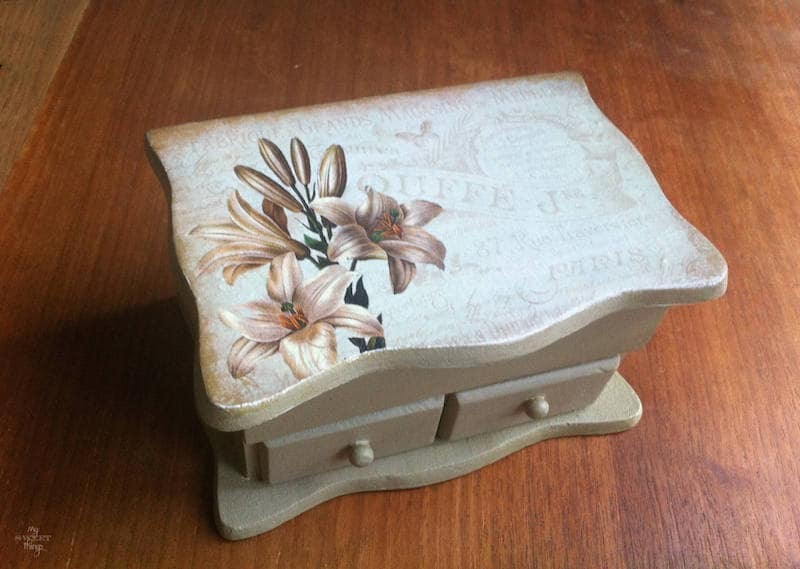 This entry was posted in Before & After, Decoupage. and tagged Before & After, Craft, Decoupage, DIY, Jewelry box, Make over, Prints, Vintage. 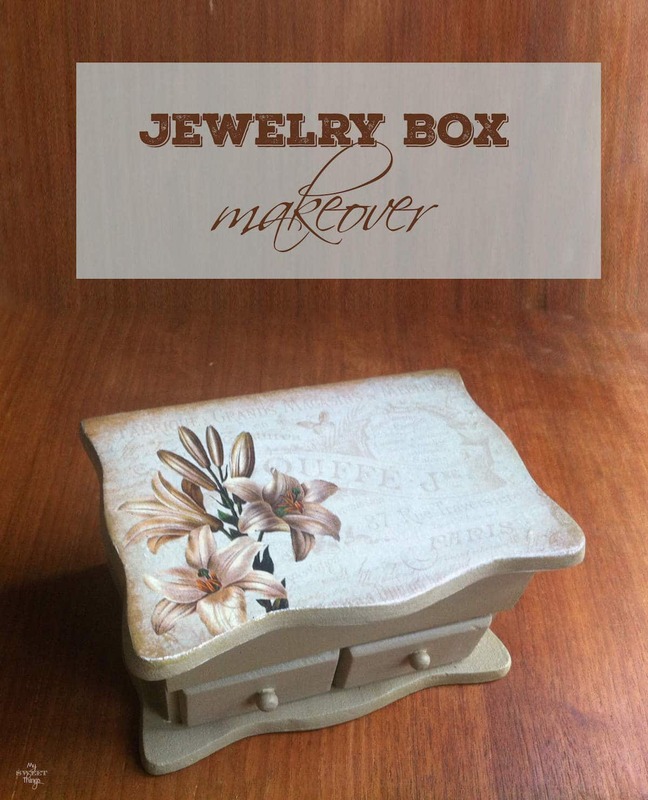 Pili, this jewelry box makeover is gorgeous!!! You did an amazing job designing the top of the box!! I also like the color you and your girls mixed up…perfect!! 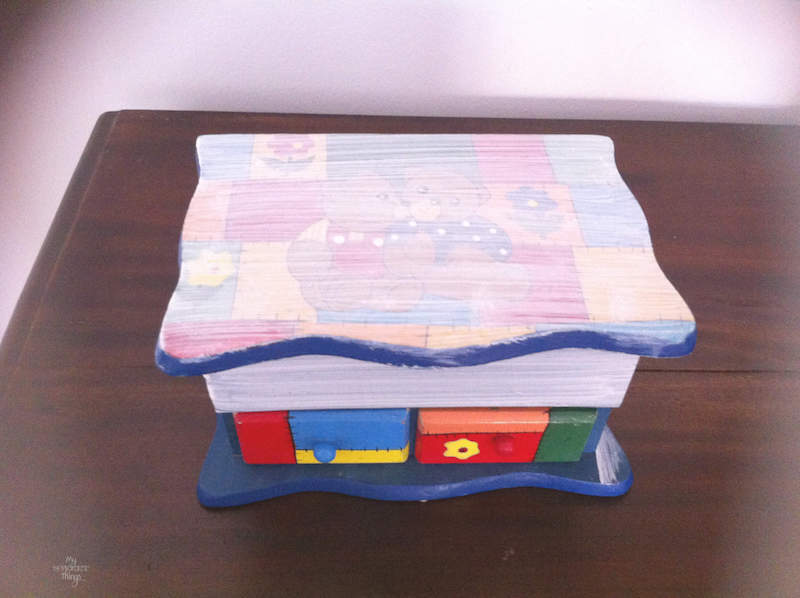 I know your friend Pili will love her new jewelry box!! Thank you so much, Keri!! We really had a great time mixing colors and discussing which colors would have formed the original we were trying to replicate. I love when I have time to play and make some designs… My mind is in another place, so relaxing! I love it….what a BIG improvement…looks amazing!!!! Thank you so much, Michelle. It has nothing to do with the original, I really liked the result. This is really pretty Pili. The design on the top and the special flower make it all the more Sweet! I am so happy your friend liked the gift. I too believe in giving special gifts to friends instead of buying. Yes, I agree, I am a huge fan of special handmade gift for others. And I think others also prefer special gifts made for them, with a purpose. Hahaha!! I don’t really remember why/when I ended up with it, but I’m glad I did it. My friend loved it and we were both happy. Thank you so much for stopping by, enjoy your week! So beautiful! I like the colors very much! Thank you so much!! I have to tell the colors are prettier than in the picture. Glad you like it too, it was fun to make it. Thank you so much, Jess. I hope you enjoy the weekend! Pili, This is such a beautiful makeover! I’m sure your friend will cherish it. Thank you for sharing with us at Brag About It! Pinning and tweeting to share. Yes, she was really happy with it. She loves vintage stuff and told me it fitted perfectly into her bedroom. Thank you so much, Regina! I love when I feel inspired and can put myself to work… time seems to stop and there are no worries in my mind. Glad you like it too! That’s pretty cool that your talent is also your refuge. You’re blessed. I love your pretty box you made over! TFS this at Cooking and Crafting with J&J! Thank you, Julie! I had a great time working on it, and my girls too. This looks really nice. I bet your friend was really pleased. Must be something about the name if she is also super creative too. Who knew? Your jewelry box turned out just gorgeous! What a difference! Thanks so much for sharing all your creativity at Vintage Charm. Thank you so much for stopping by, Tuula! Pili, you amaze me! I cannot believe the transformation! From a child’s box to this gorgeous treasure! Anyone would love it, and I’m sure your friend is astounded by your creative talents too! She does amazing things too, that’s why it was a challenge to me. I’m glad you like the jewelry box too! Your jewelry box is very pretty. I pinned it!